Robert Gildea examines France between the revolution and World War I. “Audacity! Yet more audacity! 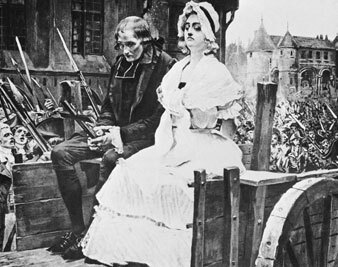 Always audacity–and France will be saved,” declaimed the revolutionary George Danton as he urged patriot volunteers to fight in 1792. For subsequent French generations, this revolutionary inheritance has involved the intractable problem of disentangling virtue from treachery. Danton was a glamorous figure, honored two years after the Revolution’s centenary with a handsome statue on the former site of his home on the Boulevard Saint-Germain. But he was also the hard-nosed man of violence who reportedly said of the prisoners massacred after the fall of Louis XVI, “Let them save themselves.” Then there were other revolutionary figures, Maximilien Robespierre above all, who could not be rehabilitated or publicly honored but whose contribution to establishing the values of 1789–liberty, equality, fraternity–was undeniable. Pursuit of those values, infamously, led France to be governed by the Terror. Robert Gildea ends Children of the Revolution, his erudite account of France’s long nineteenth century, with another tableau of bloodshed–the First World War’s legacy of a million and a half lives lost on the battlefields of France and Belgium in defense of the French Republic and French nation. Gildea’s book shows the internecine struggle there had been in France throughout the nineteenth century to secure the Republic and unify the nation, an effort that would culminate in the monumental sacrifice demanded by the Great War. That so many young men were prepared to die for a vision of France that was relatively new, and essentially contested, is testimony to the deep complexities of patriotism and the nation-state. Gildea assembles a wealth of information–historical, political, cultural and economic–to elucidate the conundrum, without pretending to explain it away. It is impossible to interpret the slaughter of a million and a half people as a triumph in any setting, but Gildea shows unforgettably a national identity winning out against all odds. It’s a lengthy, complex saga, but he manages to sustain enough buoyancy in his prose to allow it to be read from beginning to end with interest and pleasure. Gildea maps five generations, passing the memory of the Revolution from father to son, mother to daughter. First, those born around 1760, who were participants or contemporary observers of events in 1789 and afterward; then, those born around 1800, who had no memory of the Revolution but whose childhoods were shaped in its immediate aftermath; those born around 1830, whose childhoods witnessed the violent insurrection of June 1848; those born around 1860, who were children during the Franco-Prussian War and the Paris Commune in 1870-71; and finally, those born in 1890, destined, in all too many cases, to die young in no man’s land. Taken together, these five overlapping generations witnessed the collapse of the age-old Bourbon French monarchy, the establishment and failure of the First Republic, the rise and fall of Napoleon as emperor, the short-lived restoration of the monarchy, the Second Republic, the Second Empire and the Third Republic. There is an almost dizzying quantity of facts and fine details in Children of the Revolution, but this is a reflection of the frantic and unstable times Gildea sets out to cover. The ex-Jacobin Pierre-Louis Roederer (part of the first of Gildea’s generations) once boasted that he had been present for the last night of Louis XVI’s reign and for the first night of Napoleon’s. Political careers of any longevity were an exception that weathered the dramatic regime changes as best they could. More typical were myriad brief brushes with power and office that ended, if not in death by guillotine, then in obscurity. One of the considerable strengths of Children of the Revolution is Gildea’s eye for an individual example, anecdote or aphorism, combined with his comprehensive knowledge of the literature of nineteenth-century France. The writer Chateaubriand, who lost his mother to the Terror, wrote Genius of Christianity as a “mausoleum” to her and as a beacon to the postrevolutionary generation seeking a route back to “God’s house.” When he returned to France from exile in Britain in 1800, Chateaubriand found “only abandoned churches, whose dead had been thrown out, bell-towers without bells, cemeteries without crosses, statues of saints without heads, stoned in their niches.” Chateaubriand claimed that when Napoleon fell from power in 1814, the emperor said that Genius of Christianity, published in 1802, had done more to undermine him than any other book. “The alliance of Church and state, throne and altar, was never closer than under Charles X,” Gildea argues. The restored Bourbon heir, and last monarch of the senior Bourbon line, reigned from May 20, 1824, until the Revolution of 1830. The 1830 Revolution, Gildea suggests, “posed the question of whether Catholicism could ally with liberty,” just as the 1848 Revolution “posed that of the alliance of Catholicism and democracy.” Throughout the nineteenth century, religion remained as centrally divisive to French revolutionary politics as it had been since 1789. Ernest Renan makes a fascinating appearance in Gildea’s narrative, having left the Catholic Church in 1845 and been appointed professor of Hebrew at the Collège de France in 1861, where he “saw his first lecture course suspended because he denied the divinity of Christ. The lectures were a foretaste of his Life of Jesus, published in 1863.” This biography of the historical Jesus, who came “from the ranks of the people” and was “in some senses an anarchist,” inspired a millenarian sect and sold 50,000 copies in six months. The socialist philosopher Pierre-Joseph Proudhon emerges especially badly from Gildea’s story of the reversals in feminist fortunes in nineteenth-century France. “Housewife or courtesan, I see no middle way,” he announced in 1846 (better not to dignify this contribution with the term “argument”). But there was worse to come. In La Pornocratie ou les femmes des temps modernes, Proudhon suggested that women’s brains are smaller than men’s and that “all women who dream of emancipation lose, ipso facto, a healthy soul, a lucid mind and the virginity of the heart” (whatever that is). Proudhon died in 1865, but it was his revolutionary teachings that the Paris Chamber of Workers’ Unions followed when it joined the Paris federation of the International in time for the Revolution and Commune of 1870-71. The smell of bodies disgusts me less than the miasmas of egoism breathed from every mouth. The sight of ruins is nothing compared to the immense Parisian stupidity. One half of the population wants to strangle the other, and the other has the same desire. You can read it in the eyes of the passers-by. France, by now, was supposed to be a modern democracy, and yet revolutionary violence had broken out again, as it had during the Terror in 1793. The government had relinquished control of the capital, Alsace and Lorraine were lost, and other provinces were striving to recover their independence. After all the claims of “France, one and indivisible,” that there had been since 1789, nothing seemed further from the truth almost a hundred years on. Victor Hugo’s 1874 novel Quatre-vingt-treize was set in the Vendée in 1793, and as Gildea writes, it “celebrated the ‘ideal republic’ that showed mercy against the ‘absolute republic’ committed to destroying its enemies.” In reality, the ideal republic was still far off. Gildea identifies a turning point in the slow moderate republican ascent to power in the “town hall revolution” of January 1878. These elections “swept republicans into the mairies of thousands of towns and villages. Since mayors were the bedrock of the colleges that elected senators, republicans gained a majority in the Senate in the elections of January 1879.” This, as Gildea argues, was only the beginning. To ensure the stability of the Third Republic, there would need to be an established republican ruling class. Accordingly, the republican candidates devoted enormous amounts of time and money to cultivating their contacts and constituencies. But still there was no lasting peace between the moderate and radical republicans. Socialists formed an important minority on the Paris municipal council, which made its commitment to the memory of the Revolution evident in 1883 by unveiling on the Place de la République a statue capped by a Phrygian bonnet. In 1887 the council commissioned the statue of Danton, a year after Alphonse Aulard became the first incumbent of the chair in the history of the French Revolution at the Sorbonne. Like Danton, who after the Terror claimed to see in his dreams the bloodied victims of the prison massacres shaking their gory locks at him, nineteenth-century France remained haunted by bloodstained ghosts. The remaining decade of the nineteenth century saw an explosion of French anti-Semitism in the Dreyfus Affair. Gildea presents this notoriously convoluted and consequential episode as further evidence of the political and cultural struggle to unify France. The writer Émile Zola led the way in denouncing a cover-up in the court-martialing of a Jewish officer from Alsace, Captain Dreyfus, for allegedly passing French military secrets to the German army. Zola was supported by Anatole France and Marcel Proust, among other intellectuals and writers. “Once again it is up to us poets,” Zola wrote to Madame Dreyfus, “to nail the guilty to the eternal pillory.” Support for Dreyfus led to the foundation of the Ligue des Droits de l’Homme, which continued the fight for recognition of the rights of Jews and all others who had been persecuted before the Revolution of 1789 and were still being threatened by injustice as the nineteenth century drew to its close. A nation is a soul, a spiritual principle. This is made up of two things which are really only one. One in the past, the other in the present. One is the collective ownership of a rich legacy of memories, the other is the present consent or desire to live together, the will to continue to develop the inheritance it has received intact…. The nation, like the individual, is the culmination of a long past of striving, sacrifice and dedication. Gildea’s book is a substantial contribution to understanding the individual nation that is France. Ruth ScurrRuth Scurr teaches history and politics at Cambridge University. She is the author of Fatal Purity: Robespierre and the French Revolution.